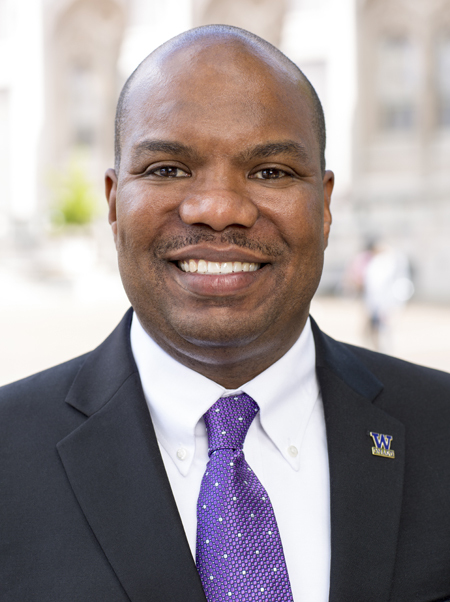 Rickey Hall is the vice president for Minority Affairs & Diversity and university diversity officer at the University of Washington. Hall has oversight of the university’s progress in diversity and works to ensure and facilitate an integrated vision and shared responsibility for diversity. Under his leadership, the Office of Minority Affairs and Diversity (OMA&D) administers programs that broaden college access, support student success and enhance diversity-related teaching and learning across campus. OMA&D also works collaboratively with and serves as a resource for colleges and administrative units as they establish, coordinate and assess their contributions to institutional diversity goals. Collaborate with campus units to foster dynamic learning environments, academic support, recruitment and outreach programs, and advance university-wide responsibility on behalf of diversity. Promote academic achievement and excellence by providing comprehensive support services such as teaching, mentoring, academic counseling, and skill building for diverse populations and economically and/or educationally disadvantaged students. Collaborate with secondary educational institutions and community organizations to ensure that there is a well prepared pre-college pipeline of students from underserved backgrounds. Engage and foster relationships with alumni, stakeholders, and friends of diversity to build upon endowments and scholarship opportunities. Build a welcoming and supportive campus climate for students, faculty and staff through Faculty Advancement, Institutional Research, and Faculty and Staff Affinity Groups. Programs and services include: College Access, Student Services and Academic Support, Graduate and Professional School Preparation, Assessment and Evaluation, Faculty and Staff Advancement, Institutional Transformation, Alumni and Community Engagement. To learn more about these programs and services visit the OMA&D web site.